Altrnative Technologies for cooling water treatment - International Independent Consultants Ltd (IIC) - cooling water consultant for Legionella control, legionella training, cooling water treatment. IIC is a truly independent consultancy specialising in water treatment solutions and has been involved in accessing many alternative technologies for cooling water applications. As such IIC is in a position to conduct on-site trials using these alternative technologies and produce an independent report for the client. 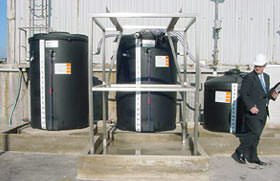 Experience shows that many of the alternative water treatment strategies have merit when used in the correct manner and application. IIC has the required experience and independence to develop a sound understanding of these technologies in order to evaluate their effectiveness on behalf of the client.